- Rodney Soto, M. D.
March 30, 2011 Orange Beach, Alabama, and Santa Rosa Beach, Florida - Microbiologist Samantha Joye, Ph.D., University of Georgia, showed images of oil-suffocated marine creatures at the bottom of the Gulf of Mexico 10 miles north of the BP Macondo oil disaster site that she photographed in recent research presented before the American Association for the Advancement of Science (AAAS) annual conference in Washington, D. C., on February 19, 2011. BP Deepwater Horizon oil rig burning after the April 20, 2010, explosion that killed 11 men working on the platform and injured 17 others. 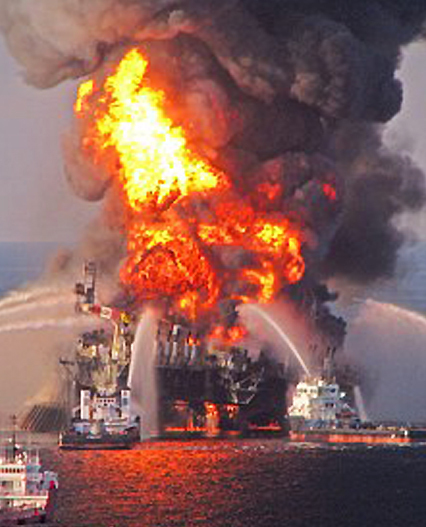 The disastrous crude oil gusher from the broken BP Macondo well a mile down on the sea floor lasted from April 20 until July 15, 2010, when the well was finally capped. Meanwhile, 770,000 gallons of toxic Corexit dispersant had been sprayed on Gulf waters to allegedly reduce the thick oil slick. Image by EPA.